In a previous post I told the sorry tale of my Synology DS106e network attached storage box. It served me well for 18 months until the fan stopped working and a scheduled backup led to the hard drive overheating. It was time to upgrade my server, and there were several options available. Buy a replacement NAS box, either a newer Synology model or something similar from Qnap, Thecus, Netgear etc. This would cost anywhere from £70 for a used item on eBay to £300 for a top of the range home/soho device. The current Synology one drive budget NAS is around £180 online. Buy a used Mac Mini from eBay. The newer Core 2 Duo/solo models fetch a high price but the original G4 versions at 1.25 or 1.4Ghz are selling for around £120. Ready made server in a small and silent box, easy to setup and expand through software. Build a mini hackintosh based on an Intel Atom processor. This is perhaps the most flexible approach, is should be able to run Leopard and hopefully Snow Leopard. Linux and windows shouldn’t be a problem either, so it has plenty of options for software. I decided to go for the third option, not really surprising since I have already built a Quad Core hackintosh and a Home Theatre hackintosh. Building something is usually more fun than buying a ready made device, although this depends on how well the end result works. With the decision made I started looking at the Insanelymac forums for details from people who had already used Atom processors. The Atom, especially the dual core version, seems to be a popular choice with hackintosh builders wanting a cheap, low power consuming computer. The Intel D945GCLF2 10.5.x Retail Installation, Drivers and Guide v3.0 by iSynapse covers all the steps of installing Leopard and has a downloadable package of everything you need. A quick search of online component retailers showed eBuyer had the board for £63. 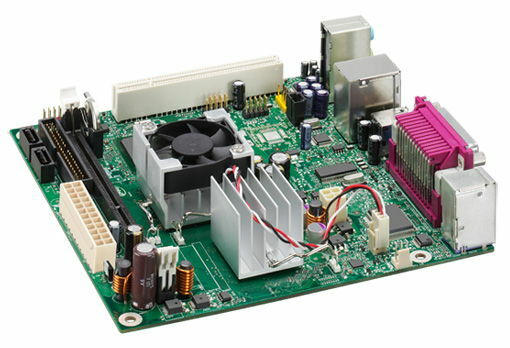 The D945GCLF2 (or Little Falls 2) is a mini-ITX motherboard, measuring 17cmx17cm. It has a dual core Intel Atom 330 soldered onto the board, video (Intel 950 like my Macbook) and Audio (Realtek ALC662 like my HTPC for 5.1 channel HD audio) are also integrated. There’s one slot for DDR2 533/667 memory, priced at £17 for 2Gb. Last requirement was a case and PSU, so I chose a Compucase model with 120W PSU for £45. That made the total around £120, roughly the same as a used Mac Mini or NAS box. There’s not much involved in putting the three components together. The 500Gb hard drive from the Synology NAS appeared to work fine once it had cooled down, so I tried using this for the Leopard install. Following iSynapse’s guide and using the packaged drivers and tools took around an hour to install and configure. The results are very impressive, performance for web browsing and other light duties is very good. I haven’t tried benchmarking the system yet so will post some results when I get time to run the tests. So far I haven’t found anything that doesn’t work, all video resolutions are available and Core Image/Quartz Extreme are enabled. Sleep is particularly impressive as one press of the power button puts the machine instantly to sleep and another wakes it with everything ready to use after around 5 seconds. For a general use computer this is ideal, and at around £200 for a complete computer with keyboard/mouse and display it represents outstanding value for money. You could choose one of the newer Nvidia Ion boards using the 9400 chipset for HD playback at 1080p, so when the price of those drops I may be tempted to build another of these mini-ITX computers to replace my HTPC. The only problem I have encountered with the Atom hackintosh is related to the role it was intended to serve. I still find Leopard file sharing to be buggy and unreliable. I understand that this is not a genuine Macintosh so Leopard shouldn’t be blamed for problems, but there are forums full of people experiencing the same issues I have on Apple hardware. Using the Finder sidebar to connect to detected shares is very unreliable. I can use command-k to connect using afp most of the time, but the most reliable method is to drag the mounted icon in the finder window onto the dock and use this whenever I want to connect to the share. I have tried every fix I could find, but so far nothing has made Leopard’s file sharing more consistent. There are many other options for fileserver operating systems. Linux is available in a vast array of distributions from full desktop to server to dedicated NAS. Windows XP can share files with easy setup, and Windows 7 RC1 is worth a try to see how the new offering performs. There’s so much choice I’m just going to have to try a few and see which is the most suitable. it’s best to make nfs shares, both Linux and windows 7 fully support this protocol and it’s much more reliable than AFP. I’ve had most problems with AFP when sharing a home directory and using the same directory connected via AFP on the server: when disconnecting the whole drive unattached so the user working at a client pc got disconnected as well. Didn’t had any problem with nfs. Is it possible to get 5.1 sound out of the motherboad’s on board audiocard? Did you ever try to get any firewire support with this? I’m looking to see what will work with my hackintosh / little falls 2 setup.